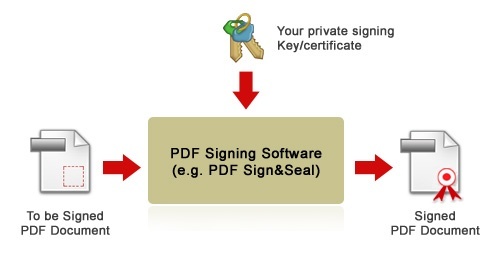 How to digitally sign PDF documents? First you need software that is capable of electronically signing PDFs, such as our PDF Sign&Seal (a desktop application for manual creating PDF signatures) or our ADSS Signing Server (a server application for bulk, automated or web-services PDF signing ). Both are available for evaluation to people that complete our registration process providing they do not use anonymous contact details . The other thing you need is a document signing certificate (i.e. your cryptographic signing key) – again you can get a free key and certificate directly from our site here. This PDF document signing certificate proves your identity in the online world and shows that it was indeed you who signed a PDF document. 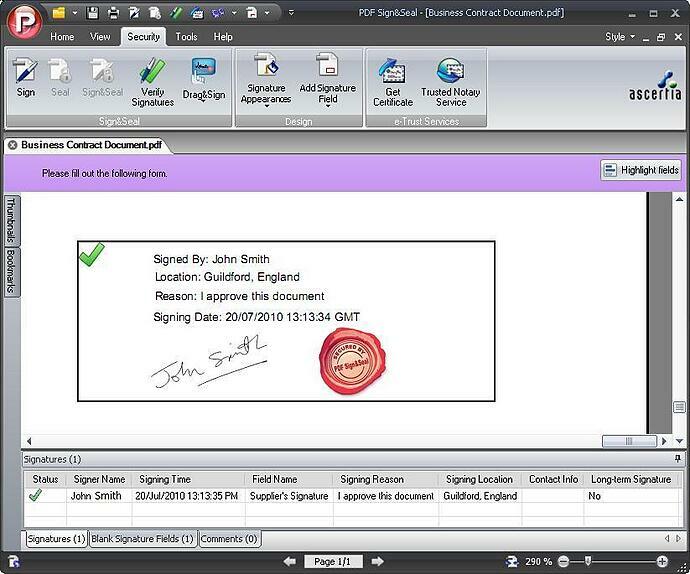 Ascertia PDF Signing applications make the process of signing a PDF document very simple. We support techniques such as signing multiple PDF documents in one go, converting Word and other common document types to PDF and signing them in one step, one-click PDF signing, auto signing of multiple pages of a document and also automated bulk PDF document signing on the server (e.g. efficiently signing PDF e-invoices in their thousands). The main thing is that signing a PDF should be as simple as signing a paper document with a pen, and for bulk documents it should be much more efficient! Of course there are many types of PDF Signatures and the rest of this article explains some of these. 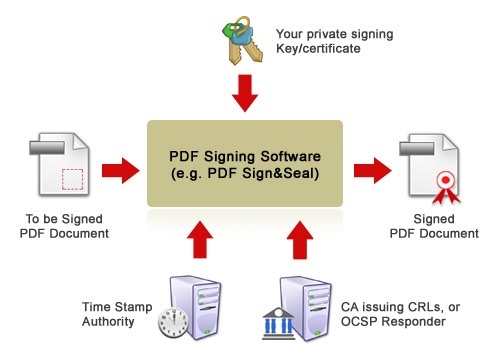 The important thing to remember is that PDF signatures are standardised (ISO 32000-1 and ISO 19005-1), so it means when you sign a PDF document using standard software like our PDF Sign&Seal or ADSS Signing Server, then these signed PDF documents can be also be read and verified using other third party PDF software including the ubiquitous Adobe® Reader or the increasingly common Foxit® Reader and other standards compliant providers. When you electronically sign a PDF a cryptographic checksum is produced which is based on the whole PDF document content and your private signing key. This cryptographic checksum or “digital signature” is then embedded within the PDF. As a result, if even one bit of the PDF document changes perhaps by accident or perhaps by a malicious attacker, then the digital signature will no longer be valid when verified. As long as you protect your private PDF signing key then no one else can sign a PDF in your name. Now if you have created an invisible PDF signature then the actual visible content of your PDF (e.g. when you print the PDF to paper) will show no indication that the PDF document was signed. 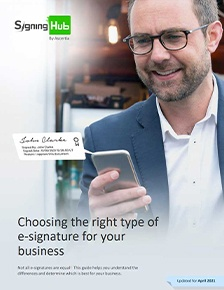 The embedded digital signature of the PDF has no visible characteristics – it is purely an electronic PDF signature stored inside the PDF document. Visible signatures are PDF signatures which actually create a visible “mark” on the PDF page to indicate that the PDF signature has been applied – this digital signature “appearance” is visible when the document is printed to paper. Of course the PDF signature appearance is fully customisable and can have company logos, hand-signature images and various other text details. Ascertia PDF signing software is at the leading edge of creating custom PDF signature appearance stamps, and also provides great flexibility on how these are positioned on the PDF page. All Ascertia datasheets and solution sheets are digitally signed and they are “certified” to protect against any data being added. These are special PDF signatures which not only protect the document integrity and prove who signed the PDF document, but also protect any further changes to the document. E.g. a certified PDF document can be locked to prevent or control additional data being entered or appended. Note these PDF signatures are often referred to as “Certification Signatures”. Certified PDF signatures are particularly important where you want to present a PDF document or PDF form where the user can enter text only in specific areas. So you can certify the document and lock its contents from change apart from allowing filling form fields and digitally signing in existing PDF blank fields. This ensures that your end-users will not edit the document in unwanted areas before returning to you. It’s important to note that a PDF certified signature must be the first signature on a PDF document. I.e. a document that is already signed cannot later be “certify” signed. Its interesting to note that certified PDF Signatures can be either visible or invisible PDF signatures. This is a special name given to PDF signatures within ISO 32000-1, where the PDF signature is applied as part of an approval process after having certified a PDF document. These approval PDF signatures are applied within existing blank signature fields inside the PDF document. 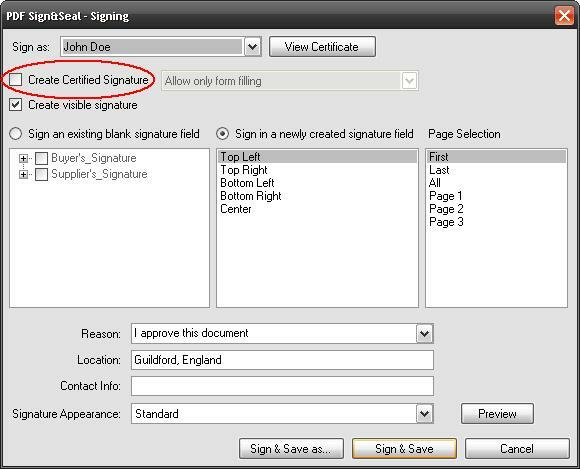 Multiple approval PDF signatures can be applied if multiple blank fields exist. The need for long-term PDF Signatures is described in more detail in this hot topic. 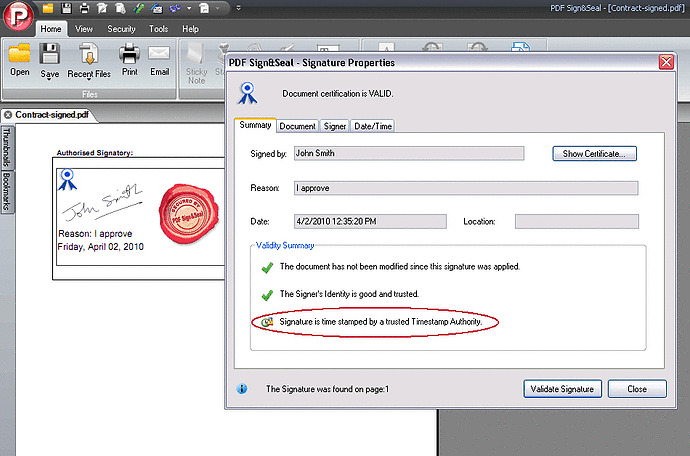 Basically such an advanced PDF signature not only creates a PDF signature but also embeds a cryptographic timestamp from a Time Stamp Authority (TSA) to prove at what time the signature took place, and also the signer’s certificate status to prove that the signer’s key and certificate were valid at time of the signing. Click here to download an example long-term signed document, it’s our PDF Sign&Seal datasheet, see the signature appearance at bottom of page 2. 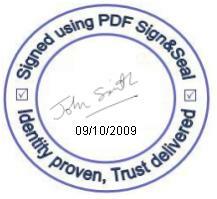 All our datasheets are signed with long-term advanced PDF digital signatures. Note long-term PDF signatures can be either invisible or visible PDF signatures. When verifying a PDF signature an important step is validating the signer’s certificate to ensure it was issued by a trusted Certificate Issuer (aka Certificate Authority or CA). Within latest versions of Adobe® Reader (v7+) Adobe by default only had its own Root CA as the final trust point. This meant in order to automatically get your PDF signatures verified successfully (and hence a green tick) you needed a signing certificate which was issued by one of the recognised subordinate CAs authorised by the Adobe Root CA (these included GlobalSign, GeoTrust etc). This ensured that your signing certificate chained to the Adobe Root CA. Such certificates are called Adobe CDS certificates. CDS stands for Certified Document Services. 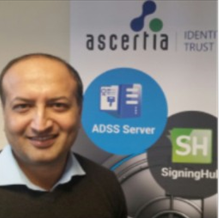 Ascertia PDF Sign&Seal and also ADSS Signing Server both support CDS certificates as standard. Of course an alternative option to getting your PDF signatures trusted within Adobe Reader is to add the new CA to the list of trusted CAs. We provide a brief note on how to configure this here. This allows you to trust a preferred certificate authority however sometimes even making this simple one-time configuration change in Adobe Reader is too much of a burden for end-users and hence Adobe CDS certificate are valuable in such cases. What is the Adobe Approved Trust List (AATL)? Since Reader v9, Adobe now allows other CA’s to be added to Adobe Root Trust Anchor list as final trust points. Essentially, both Acrobat® and Reader have been programmed to reach out to a web page to periodically download a list of trusted 'root CA' digital certificates. Any digital signature created with a PDF signing certificate that can chain back to one of these CAs will be trusted by Acrobat and Reader 9.0 and above. If you want to verify that the Trust List is enabled, go to Edit (Windows) / Acrobat (Mac)->Preferences->Trust Manager and be sure that the “Load trusted root certificates from an Adobe server...” check box is checked. You can click the “Update Now” button in that same dialog box to download the latest version of the Trust List from Adobe. Signing a PDF is essential for protecting the document’s integrity, proving who has signed and approved the PDF data and when this PDF signature took place. PDF signatures can be invisible or visible. 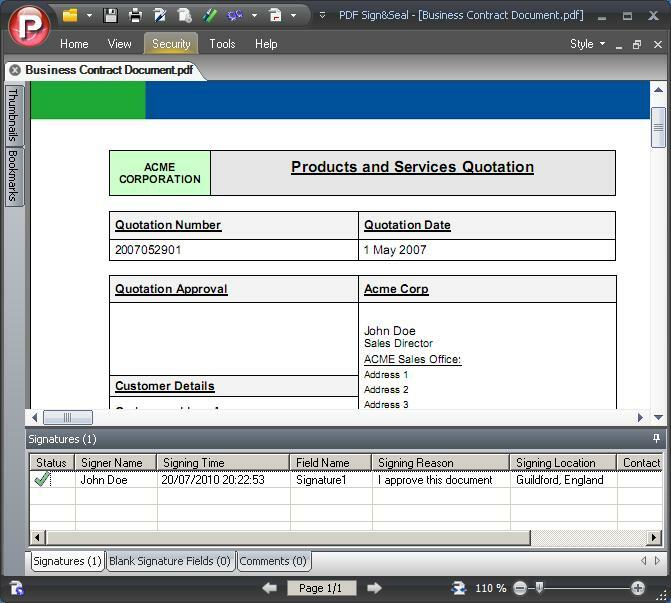 PDF documents can be locked with certified PDF signatures, although approval signatures can still be applied to such documents if there are existing blank signature fields before the certified signature was applied. Advanced PDF Signatures (referred to as PAdES signatures) with embedded trusted timestamps and signer certificate status information, are essential for verifying PDF documents in the long-term. When verifying PDF signatures it is important to determine whether the PDF signing certificate “chains” to a final trust point or trusted CA. There are three options: 1) your certificate should chain to Adobe Root CA (in this case you have a CDS certificate) 2) your certificate chains to a third party CA and Adobe Reader has been configured to trust this CAs 3) your certificate chains to a CA which is part of the Adobe AATL program and you are using Reader v9+ to verify the signature.